A legal bedroom in NYC must have minimum dimensions of 8 feet on either side, including a minimum ceiling height of 8 feet and must be at least 80 square feet in size. Furthermore, a legal bedroom must have at least two forms of egress, one of them being a window no smaller than 12 square feet. For a bedroom to be considered legal, it must be possible to access a bathroom without having to pass through any other bedroom. 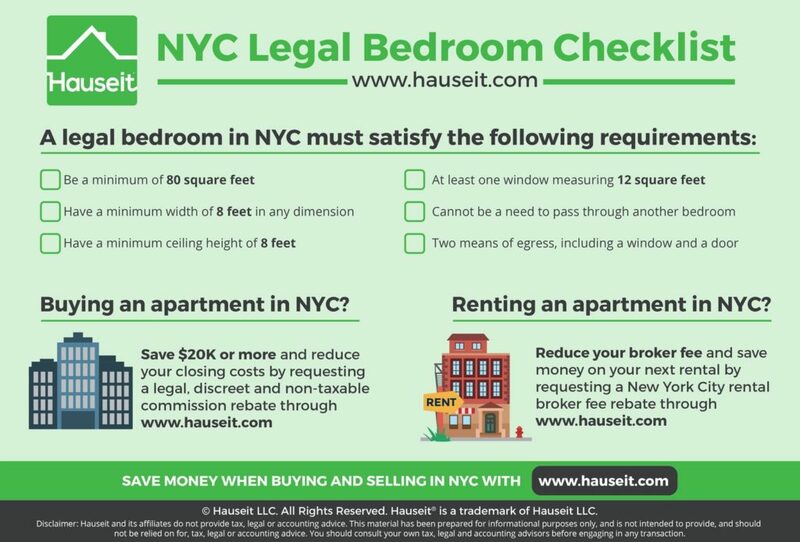 NYC real estate agents are notorious for stretching the truth, especially when determining what rooms qualify as legal bedroom in New York City. 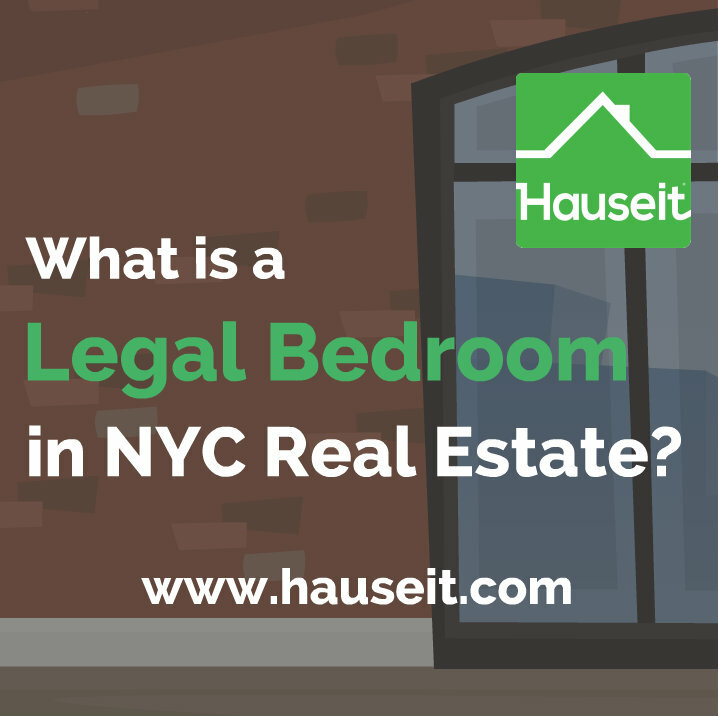 In this article, we’ll explain the requirements of a legal bedroom in NYC in detail. We’ll also dispel false truths about legal bedrooms in NYC, such as the myth that all bedrooms must have a closet. Is a non-windowed bedroom legal in NYC? Does a bedroom in NYC need a closet to be considered legal? What are the minimum bedroom dimensions in NYC? What are the minimum dimensions of a habitable room in NYC? 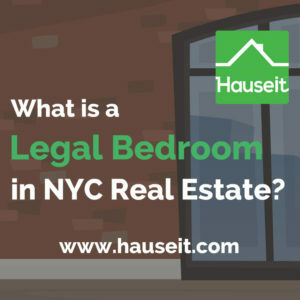 Is a bedroom legal in NYC if you must pass through another bedroom to access it? Does it matter whether my bedroom is legal as a renter in NYC? If the apartment has three or more bedrooms, one-half of the bedrooms may have a minimum dimension of 7 feet. If the bedroom is in a basement or on the top floor of a converted dwelling (such as a brownstone with multiple apartments, it must have a minimum ceiling height of 7 feet. If the bedroom has a sloped ceiling, there must be a clear ceiling height of 7 feet over at least 1/3rd of the room. The window cannot be a lot-line window. The window must open onto a street, yard or court on the same lot. You should also know that a bedroom in NYC is NOT required to have a closet for it to be considered a legal bedroom. The rules and regulations concerning legal bedrooms in NYC are located in the New York State Multiple Dwelling Law as well as the New York City Administrative Code. A windowless bedroom is not considered to be a legal bedroom in NYC. This is a commonly asked question for buyers who are considering loft units. Many floor-through loft apartments in NYC have a large square footage but very few windows. Just because there is ample space to modify the floor plan and add rooms does not mean that you will be able to create legal bedrooms. If you are buying a loft or a lofted apartment, you should leverage the expertise of your buyer’s agent and real estate attorney to have them confirm the current legal configuration of the apartment you are interested in purchasing. No. Contrary to what you may have heard, bedrooms in NYC are not legally required to have a closet. However, you should be mindful of whether or not bedrooms (and the apartment altogether) have sufficient closet space. Having poor closet space can make your life difficult while you live there and make it more difficult for you to sell in the future. Does the current floor plan / layout offer an easy way to add more closets? If it’s not possible to add closet space, does the building have storage? If so, is there a a waitlist? How much does storage cost? If storage space is important for you, ask your buyer’s agent what options are available in the building you are considering. A seasoned buyer’s broker will know to request the storage unit and bike hanger documentation from the listing agent. If the building does not have separate documentation regarding storage, the storage policies are likely discussed in the house rules documentation. The minimum bedroom dimensions in NYC are 8 feet in any dimension with a minimum ceiling height of 8 feet. A legal bedroom in NYC must have a minimum square footage of 80 feet. It must also have at least one window measuring no less than twelve square feet. There are a few exceptions which permit a legal bedroom in NYC to have dimensions less than 8 feet. A room in a class B multiple dwelling (hotels, boarding schools, etc.) as defined in section four of the multiple dwelling law which may have a minimum floor area of sixty square feet and a least horizontal dimension of six feet. Pro Tip: Be careful of loft apartments being advertised as duplexes with so called bedrooms on the second floor. Often times, these second floors are no more than mezzanine levels created out of a single floor loft apartment with high ceilings. Very often, these so called second floors will simply have a ladder to the sleeping area rather than a true staircase. The easiest way to determine whether a duplex is truly a duplex is to consider the ceiling heights and the legal requirements discussed in this article for a legal bedroom in NYC. Do both floors have a minimum ceiling height of 8 feet? If so, this means the total ceiling height of the unit in the open areas must be at least 16 feet. Please read our guide to buying a duplex apartment in NYC if you’re considering buying this unique property type! Habitable rooms in NYC shall have a minimum clear width of eight feet in any part, a minimum clear area of eighty square feet and a minimum clear ceiling height of eight feet. §27-751 Minimum dimensions of habitable rooms. No. A bedroom is only legal in NYC if you are not required to pass through a different bedroom to access the bedroom. Furthermore, for a bedroom to be considered legal you must be able to access a water-closet (bathroom) from it without passing through any other bedroom. §82. Privacy. In every apartment of three or more rooms in every class A multiple dwelling erected after April eighteenth, nineteen hundred twenty-nine, there shall be access to every living room and bedroom without passing through any bedroom. §179. Privacy. In every apartment of three or more rooms in every class A converted dwelling there shall be access to every living room without passing through any bedroom, and to at least one water-closet compartment within the apartment from every bedroom without passing through any other bedroom. Pro Tip: Very often you’ll see owners of studio apartments try to convert their apartments to a one bedroom by adding in an artificial wall to create a private sleeping area. These arrangements usually won’t result in a legal bedroom, either because the sleeping area won’t have a window or two means of egress. If the bathroom is connected to the sleeping area, the very act of putting in an artificial wall can seal off the bathroom to everyone else in the apartment, and thus render another bedroom illegal because you’d have to traverse through this new sleeping area in order to reach the one bathroom. Keep in mind that very large loft apartments can legitimately create legal bedrooms, typically by walling of parts of the living room and making sure each bedroom has a window. Safety considerations aside, there’s no real long-term downside if you or one of your roommates is sleeping in a windowless or tiny room (illegal bedroom) in NYC. After all, you are likely paying much less to sleep in that room versus what you would have paid if you rented a legal bedroom. When you are ready to upgrade your apartment, you can save money on your next rental by requesting a NYC rental broker fee rebate. The topic of illegal bedrooms is much more important if you are buying a condo or buying a co-op apartment in NYC. Unknowingly purchasing an apartment which is incorrectly marketed as having more bedrooms than what is legal can cost you money down the road. This is because you won’t be able to market it as having as many bedrooms you thought it had when you purchased it. If you are financing your purchase, you may encounter difficulty with your appraisal if it turns out that the apartment has fewer legal bedrooms than what you were expecting. However, just because a bedroom is illegal in NYC does not mean that the space is wasted or not valuable. Buyers will always value the optionality of having an extra room (such as a Junior 4 configuration), however it’s simply not worth as much as having a legal bedroom. Pro Tip: Prospective buyers and tenants must do their own due diligence before proceeding with a transaction as real estate laws are very favorable towards sellers and developers in New York State. Furthermore, listing agents are very prone to misrepresent facts about the properties they are marketing in NYC, especially when it comes to the number of legal bedrooms an apartment has. All too often we’ll see a studio apartment marketed as a legal 1 bedroom apartment, and sometimes the square footage will be significantly inflated as well! If this scares you, it should. Make sure you work with a seasoned buyer’s or tenant’s agent who will guide you through all these traps and pitfalls. 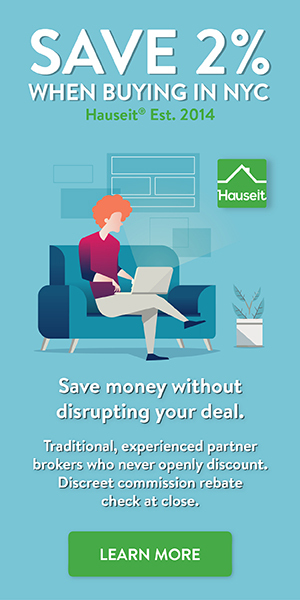 If you work with an experienced real estate agent through Hauseit, you’ll also receive a check from your agent for a portion of his or her commission at closing!